Excel normally sets the height of rows within your worksheet to reflect the size of the largest font used on the row. You can, however, adjust the height of the row to any size desired. For instance, you might want to add additional space before a row. Rather than insert a blank row, you can increase the height of the row so it has blank space before it. The easiest method for adjusting row height is to use the mouse. All you need to do is move the mouse pointer into the row header area (the gray area at the left of the row). When you move the pointer so it is over a dividing line between rows, it changes shape to a double-headed arrow. When the mouse pointer is this shape, you can click on the left mouse button, hold it down, and drag the border to a new position. When you release the mouse button, the row is resized to the new height. 1. Select any cell in the row you want to adjust. If you select a cell range that includes cells in multiple rows, you can adjust the row height for more than one row at a time. 3. In the Cells group, click Format. Excel displays a selection of choices. 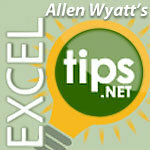 Excel Tips excel, Microsoft Excel. permalink.